The Invoice page is populated as the booking progresses. From the Invoice tab you are able to download the invoice a PDF, email the invoice as a PDF from Syngency, and easiy view a profit summary. The Invoice number is automatically generated once the booking status is set to Invoiced. 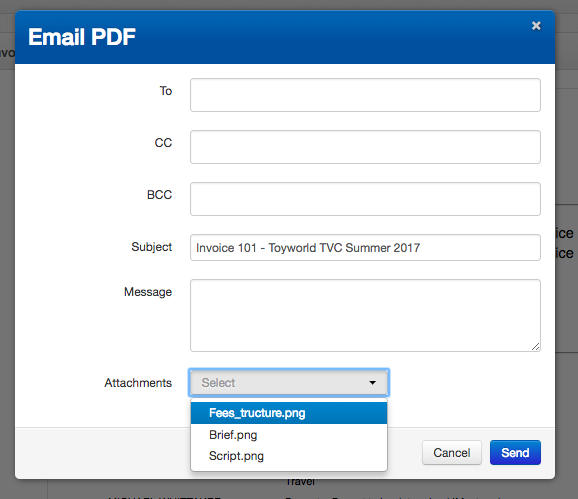 When emailing an invcoice from Syngency, you are also able to attach documents you have previously uploaded into Attachments - the pop up window that appears when you click Email PDF, has a drop down at the bottom which allows you to attach a document.